This factory complex doesn’t come from any specific prototype. It depicts a Peach Packing Plant that could be found anywhere across the South. It fits into just about any era and local. The main building is kind of “T” shaped, with a really interesting roof line. There is also a unique looking cupola and lean-to’s that can be located in different places. The loading dock is easily re-configured or could be left off. A really great line side industry. As the title implies “01” probably means that there will be more of this style of structure coming in the future. 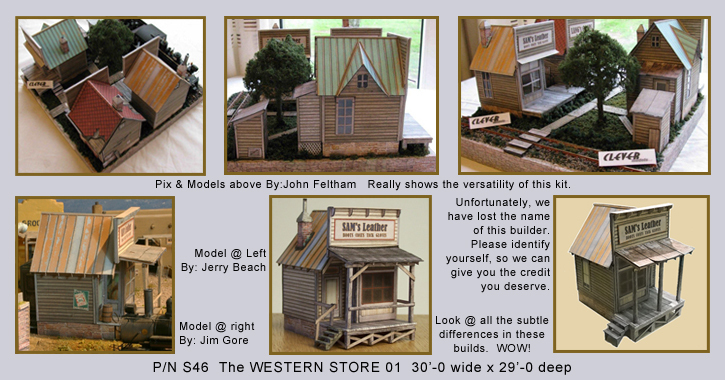 We have had allot of requests for some Western motif structures. to what will be a line of generic Western prototypes. This structure comes with a complete interior and at least three different signs. This was a difficult building display properly. Mainly because of it’s complex shape. It is a large, two story brick garage with some very interesting lines. There is a tall, wooden staircase, to the second floor, against the left wall. This is another of John Kosma’s designs from his Gypsy Trolley Line. Also included, is a shadow box, showing two antique cars. You can put it in the doorway, if you decide to build with that door open. This is our version of John Allen’s famous Gorre Water Tank. Previously, it has only been available on DVD, but it’s such a great structure, we had to make it available here. It’s not an exact copy, but you get the flavor of this historic structure. This is a fairly easy structure to build and just screams to be kit bashed. I’ve used the base building many times. It’s a great little brick building, all by itself.